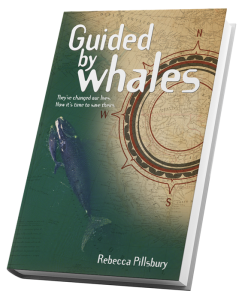 Rebecca Pillsbury is a certified marine naturalist, award-winning memoirist, and lover of all animals from land and sea (but especially partial to those that weigh from 400 pounds to 200 tons). 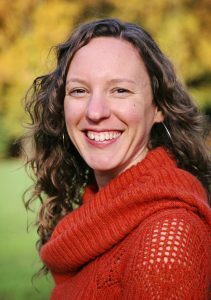 Through her publishing company, Duende Press, she helps business leaders, adventure travelers, celebrities, and others tell their transformational stories. Rebecca lives on an island in the Pacific Northwest. I am a creative writer, dancer, and lover of life in all of its forms—plant, animal, and human. I have a strong spiritual nature, and I feel closest to what I call God when I am quietly immersed in the natural world. For me, there is nothing more powerful than an intimate encounter with a whale in the wild. How did you embark on your journey with this book? How would you say whales have guided you in your own life? After seeing the movie Free Willy at the age of 11, I became obsessed with orcas and other marine animals. I plastered my bedroom walls with images of whales and ocean life and started the “We Can Make a Difference” club in my 5th grade class. I’ve always felt an affinity with nature and animals, but especially cetaceans. I flirted with the idea of becoming a marine biologist, but I was afraid of all those science classes! I pursued my other passion—writing— instead. Whales guided me from Wisconsin to Oregon, however, where I volunteered through various whale museums and whale watching programs. 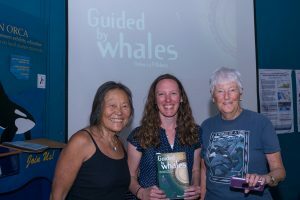 I became a certified marine naturalist through The Whale Museum on San Juan Island in 2017, which helped guide my vision for this book – I realized how many people, just like me, thought they couldn’t do anything to help the whales without becoming scientists. That is so not true! I wrote this book to feature all of the amazing passion projects and creative career endeavors people from all over the world are embarking on in order to help protect whales and their habitat. Whales continue to guide me in many ways – by observing them and studying them, I have learned lessons in patience, forgiveness, joy, love, and playfulness. What are a few of your favorite activism stories from the book? They are all special to me, but there are a few stories that stand out as particularly unique. One is Hannah Fraser’s; she became a voice for the oceans and cetaceans by forging a career as a mermaid, or underwater performance model. 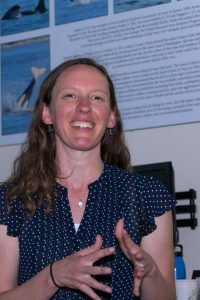 Another is Meegan Corcoran’s; after learning about the harmful effects of navy sonar on cetaceans during her eight years of service, she studied marine law and became a consultant on cases taking the navy to court. Finally, Ray Fryberg’s story touched me profoundly; he spoke of his tribe’s spiritual relationship to the killer whale and the efforts the tribe is undertaking to restore salmon runs for the endangered Southern Resident killer whales. Did you learn anything about whales that you didn’t know before while writing Guided by Whales? Oh, yes! So much. During the research stage, I read countless books and attended numerous workshops where I learned about the behaviors and intelligence of cetaceans and the threats they’re currently facing. I had no idea how extensive the problems were. However, I have also been deeply inspired by the number of individuals and organizations fighting on their behalf. Also, most of my previous knowledge about cetaceans was about orcas and gray whales, but I really enjoyed learning more about humpback and sperm whales through the writing process. Both exhibit signs of altruism—sometimes even across species—that leave me in awe. After speaking with and writing about so many different types of activists, what would your advice be to, say, a student who would like to get involved? I would say that it’s easy to become overwhelmed by the decision to take on such a multi-faceted issue as cetacean protection, or environmental conservation, so it’s best to narrow your focus down to a niche issue (anti-captivity in your state, for example). Once that issue is selected—the one you feel most passionate about—create a plan that breaks tackling the issue down into manageable steps. Get together with like-minded individuals (virtually, if necessary), to keep you engaged and inspired (you’ll likely need to lift each other up when one of you starts to feel discouraged). Having a plan, however, is essential – talk with experienced and successful activists to learn from their mistakes so you don’t reinvent the wheel. Also, do your research! Know who the right people or governmental entities are to address your efforts to. Finally, think outside the box. As Guided by Whales illustrates, something such as creating a “curtain of 30,000 origami whales” can make a powerful visual statement and be more effective in communicating a message than a standard political protest. Finally—you’re never too young to make a difference! Did you travel at all while writing the book? If so, where was your favorite location and what did you learn there? I did travel—mostly around the Pacific Northwest. My favorite experience was staying at the Quileute Oceanside Resort in the Quileute Nation village of La Push, WA. I attended the tribe’s Welcoming the Whales ceremony, in which songs and dances were shared that celebrated the return of the migratory gray whales. Previously a whaling nation, today the whales are appreciated among the Quileute as spiritual guides. The area is quite remote by today’s standards, surrounded by the Pacific Ocean and Olympic National Park, so it was easy to imagine the natural beauty the Native people must have seen and felt there, over a thousand years ago. I was saddened to learn, however, that the generous bounty the sea used to provide is no longer available – there are dead zones in the water due to ocean acidification and deprivation of oxygen, and much of the fish and seafood are too contaminated to eat. 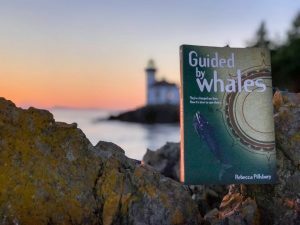 What do you hope readers will take away from Guided by Whales? First, I hope readers finish the book with a general understanding of the far-reaching and complex issues facing our oceans and cetaceans. Second, I hope they feel inspired to take action on their behalf. My desire is not to have readers dwell on the negative, but to be encouraged by the great work being down around the world to right previous wrongs. Overall, I feel each generation is born with a more intrinsic understanding that the earth has a limited carrying capacity, and that we are to become better stewards of her gifts (upon which we rely upon to survive). I hope readers see themselves as participants in the protection of the planet—that practically every decision each of us makes every day has some sort of impact on the earth and its human and animal inhabitants. Everything is interconnected. It is available at various whale museums around the Pacific Northwest (such as The Whale Museum in Friday Harbor, WA, The Langley Whale Center in Langley, WA, and the Whale, Sea Life, and Shark Museum in Depoe Bay, OR) but it is also available on Amazon.com. Questions or comments can be sent through my website at www.duendepressbooks.com. I love to hear from readers! Thank you so much to Rebecca for the opportunity to interview her.